Are rodents spoiling your bird feeding gig? There’s a few easy ways to deter unwanted guests and get back to the most enjoyable hobby of feeding the birds! Use Seed Trays: Adjustable bird seed trays aren’t just for hanging bird feeders, you can use them right on garden poles too. Depending on your set-up, there’s a seed tray that will work. Recycled plastic and wooden birdseed trays (or seed catchers) feature tough metal screens that are easy to clean. These are perfect for 4×4 wood posts where the bird feeder is mounted on- or hanging from the top of post. The large platform areas also create additional feeding space for other birds who may not use the feeder itself, so it’s like getting an extra feeder for free. Feed Clean: Because birds are like little kids, they tend to go for the good stuff- or rather the premium bits found in some seed mixes. Less expensive birdseed is really no bargain at all… when the seed is discarded and kicked out onto the ground, it becomes an open invite for pests! Start with quality seed so there’s no waste left behind in the first place. No-Mess or No-Waste seed mixes may cost a little more but they do what their name implies. Sunflower hearts are also a great option for no-mess feeding because lots of different birds will partake. When high quality mixes are purchased in larger size bags, the cost is basically offset as to buying cheaper seed in small quantities. And everything is consumed by birds – not left on the ground for pests! 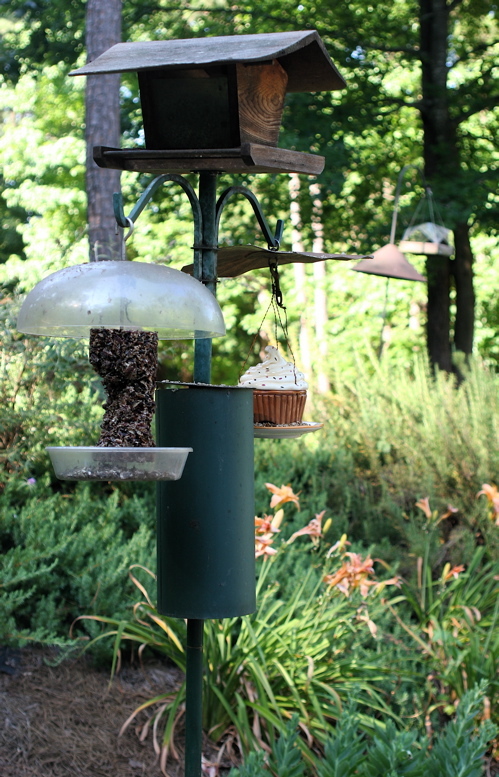 Use baffles: Keep pests (and squirrels) from climbing up to bird feeders. Some folks insist baffles don’t work- but they need to be installed correctly! You must be sure critters can’t jump sideways from something that allows them access to the feeder via super vault… a skill at which they’re quite capable! Offer water: By far, the easiest and most effective way to attract birds! 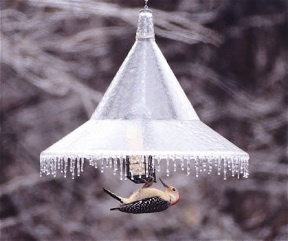 Fresh water is visited by birds who may not even use feeders, and especially during frigid weather- when natural water sources tend to freeze, it can be a life-saving element for your resident friendly fliers braving the elements. 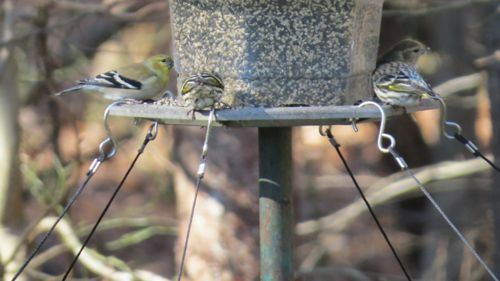 Try one or a few of these options if you’ve given up on feeding feathered friends… you may be pleasantly surprised as the results should prove successful! The shortest day of the year… with the most to accomplish in the least amount of time! But the days do get longer- yes please! Busy holiday times can be harrowing, the gift list is still incomplete, traffic is absurd, weather is frightful, yada, yada, yada! If you’ve waited until now to order anything online, chances may be slim for Christmas delivery, or extremely expensive for an expedited service. Don’t fret, because good things really do come in small packages! 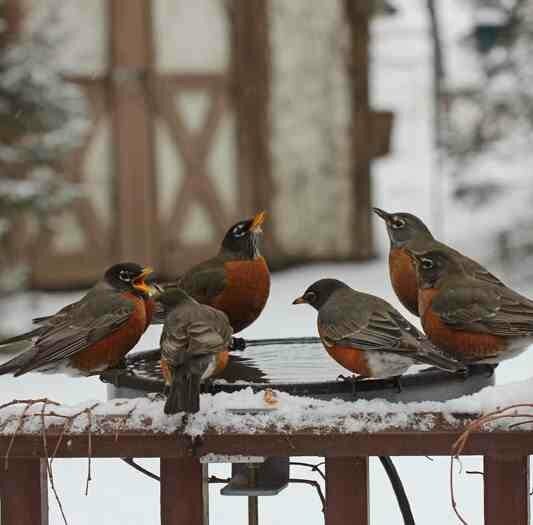 If they happen to fancy birds, a birdbath heater or heated birdbath will be a huge hit… for the birds! They’ll flock to a fresh water source in frigid weather, showering the recipient with some really big shows! Should a heater not quite cut it as the perfect present, a gift certificate will let them shop and choose their favorite birdbath too! 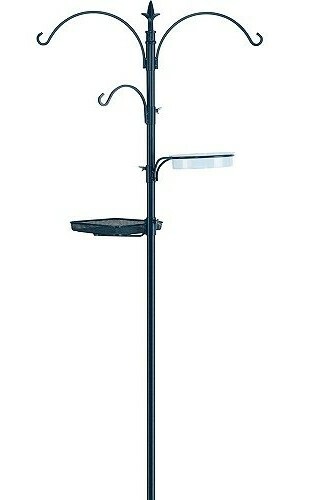 Separate solar fountains can be added to their own existing birdbath, bringing a new dimension to the birding thing. Birds adore moving water and many different species are attracted to it big time… even those who may not use birdhouses or feeders. 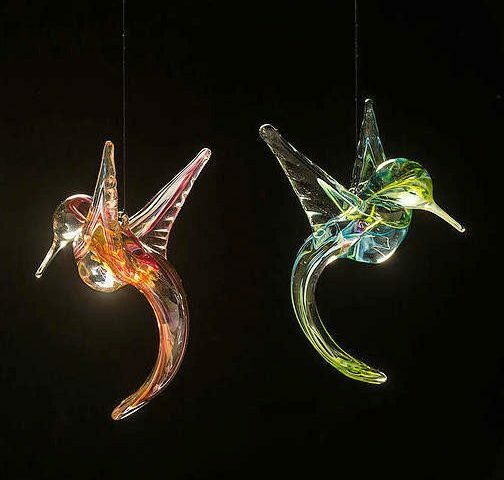 Hummingbird Sun Catchers are an easy ship, decorative for their home, made in Canada and done in hand-blown glass. Stunning when hung in front of a window, mesmerizing as they twinkle while catching light. A collector’s piece to cherish, pretty enough to be passed down through generations . Head on over to our other gift guide, it seems to have gotten a bit further along than this one, and just about everything shown there is available and in stock here! And if you happen to be local in the Atlanta area… then luck just struck! 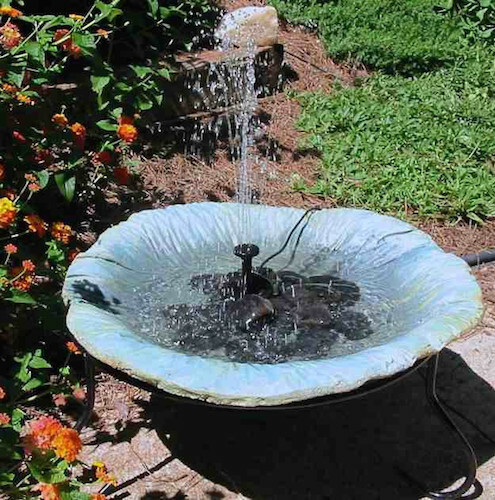 Give us a call to come shop… we’re stocked with birdbaths, edible birdhouses, copper roof bird feeders, and lots of other cool garden whimsies. The very best gifts for the nature buff on your list! 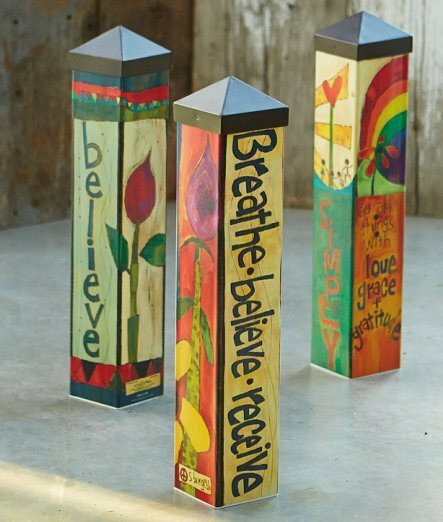 Breathe and Feed the Birds… we have those Garden Art Poles too! Versatility is really the name of the game when it comes to wild bird feeding accessories. For any investment, you want it to last and you want it for year-round use (should resident birds stick around your locale). Well, these bird feeder brackets aren’t just for feeders! Several types of quality hardware brackets offer options to entice birds year round; with food in winter or fresh water in sweltering heat. This long-reach deck-mounted bracket holds a mister out over the front porch in summer. The arm swivels making it simple to redirect the water every few days. The garden below has grown amazingly lush, and birds & butterflies both adore the mister’s gentle spray. 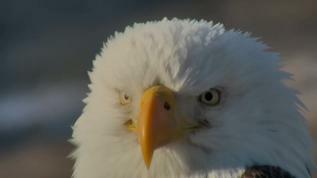 Adult birds will fly through soaking up water in their wings and return to the nest cooling off babies. Pretty cool really… both literally and figuratively! Round Bird Feeder Brackets like these also attach to a deck or porch rail. If the kitchen sink happens to be at a window overlooking the deck- then bam… you’ve got the ultimate window feeder too! The bracket’s perfect for a birdbath as well. No that’s not a potato, it’s a large rock used to weight down the copper bowl. Any idea how many people ask if that’s a potato? There are also brackets you can easily attach to an existing pole system. 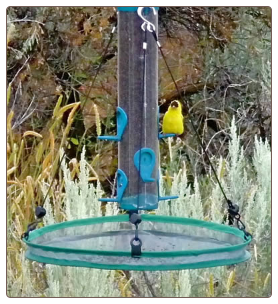 The extra arm allows for hanging 2 or 3 more feeders (or a bird bath). Just because something is packaged/labeled a certain way doesn’t mean you can’t use it for something else. Wild bird feeding can include trial & error whether you’re just starting out or have been at it for years. Squirrels raiding the feeder? Move it and learn about baffles. No takers in your birdbath? Change the water more often and add some rocks for easy footing. Finches not eating thistle seed? Change it… it’s likely old & stale or worse, moldy. Stuff like this makes a world of difference to birds and your bird-watching enjoyment! You may have noticed increased activity at your hummingbird feeders because the “crazies” are upon us! The downward stretch to summer’s end, when the tiny sprites are gearing up for Southern migration. As the slower traffic at feeders and nesting come to an end, hummingbirds are busy getting as fat as they can for the long journey home. Ant moats may or may not be critical to your hummingbird feeder’s popularity. Simply put, it takes just one ant in nectar to ruin the party! 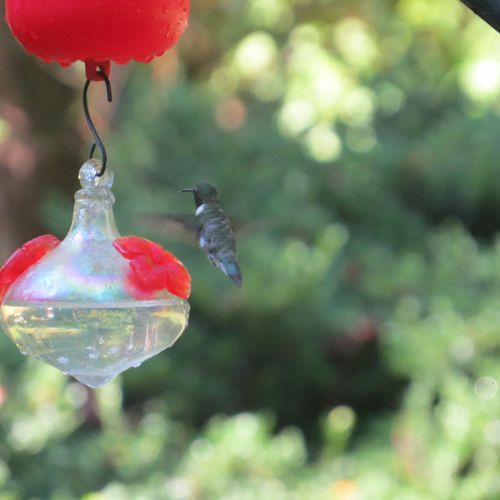 The good-for-nothing pests must emit something extremely nasty for hummers to ignore sweet nectar… especially when you’ve just changed it and hung a sparkly clean feeder. It’s so annoying! Avoid the headache and try an ant moat if you don’t use them yet. This minimal investment will yield big results, but you mustn’t let water evaporate for moats to function properly. One hack is to add a drop of salad oil to the water because it slows evaporation in extreme heat. A Squirrel Baffle that Absolutely Works? They all do… when placed correctly! It’s just baffling to us when folks claim they can’t keep the pesky critters out of bird feeders! With about 15 different feeders at our own place, squirrels simply aren’t an issue. 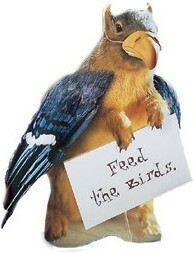 Yes, we feed them too and no, it’s never enough! When placing a feeder with a squirrel baffle, it’s well worth five extra minutes of time to plan your strategy. After all, it is a war, but with the right tactics… you can easily win! One of the biggest, most important issues is the horizontal launching point! You baffle a pole so they can’t climb up, and you hang a baffle over a feeder so they can’t climb down. But none of this even matters if they can jump sideways from something to gain access. And that’s just what they’ll do, with fancy acrobatics and uber-squirrel strength… they’ll launch themselves as much as 10 feet clear over to the feeder if there’s a a good place or thing from where to jump! 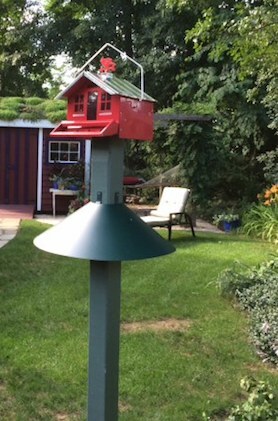 Pole mounted squirrel baffles should be placed so the bottom is at least 4 ft. from the ground. If any closer, the critters won’t even bother trying to climb – they’ll jump right up, bypassing the baffle from ground level. 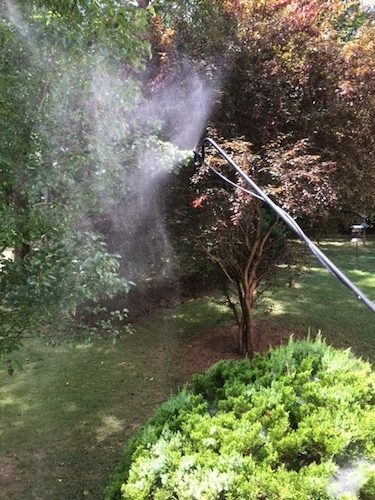 Even when placing a feeder that uses a hanging baffle, be sure there’s a 10 ft. clearance between the feeder and any other object such as a tree, railing, wood pile, bench… anything! Squirrels will test your patience, and they’ll have you believing they’ve won the war. But with a one-time investment in a decent squirrel baffle, and five minutes of thought, you’ll save tons of birdseed and your nerves when dealing with furry critters raiding your feeders! Because ground waste can easily spoil and become moldy, it poses the threat of illness to birds. It may attract less desirable critters as well, causing many to give up on feeding the birds 🙁 But larger bird seed trays like these do so much more than just catch fallen seed! Not only for hanging feeders, but the big diameter style may be used with a pole mounted feeder as well, imagine that! 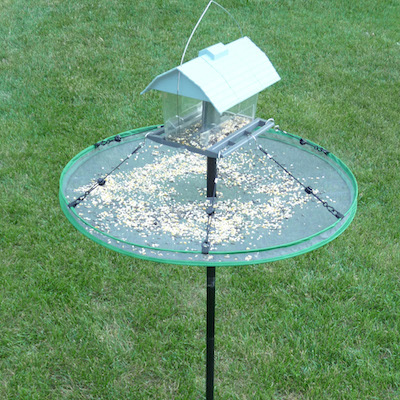 It offers an extra feeding area for birds who may not even perch at the feeder itself. Simply by cutting a slit in the center of the durable mesh netting, it slides on and off the pole for easy cleaning. In a pinch, or as an extra option, a small dish may be placed on the platform to offer some variety for birds. We use a small clay saucer to hold mealworms for our bluebirds, phoebes and warblers. 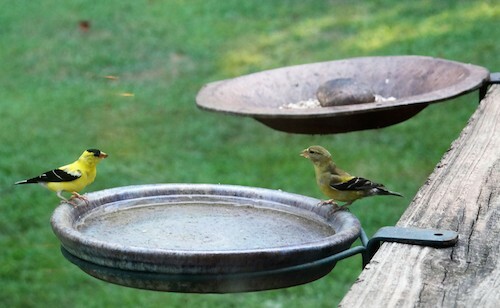 Luckily, goldfinches don’t care for worms… or they’d be gone in a flash! 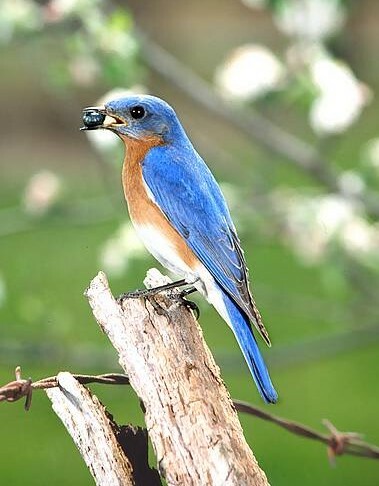 Setting up a small dish-like feeder with worms is most helpful when mom and dad bluebird are teaching their fledglings how to access the goods! 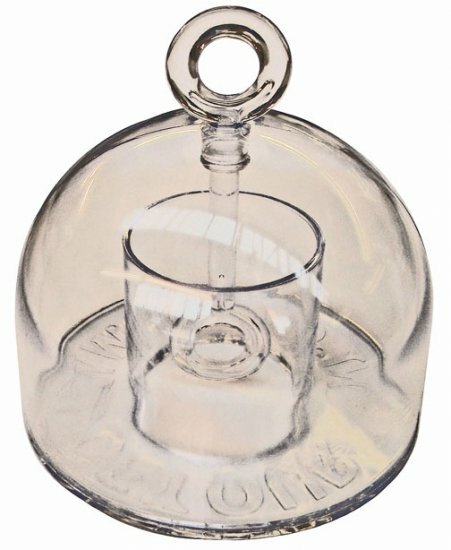 These affordable and innovative seed catchers are a delight to birds and hosts alike! Anything that keeps ground mess to a minimum, offers additional feeding space to see more birds, and even lets you create a new feeder on the platform will absolutely enhance the backyard birding experience. We use them at home too- so validated as pretty cool by our standards! A Decent Squirrel Baffle IS the Answer! Since New Years is the time for resolutions, here’s a good one to keep your sanity. 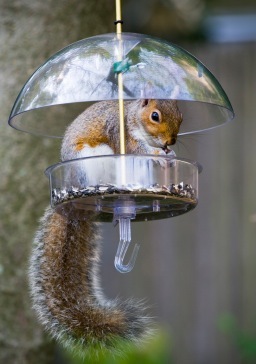 Because squirrels will always be a part of feeding the birds, you can resolve to actually baffle them for good! 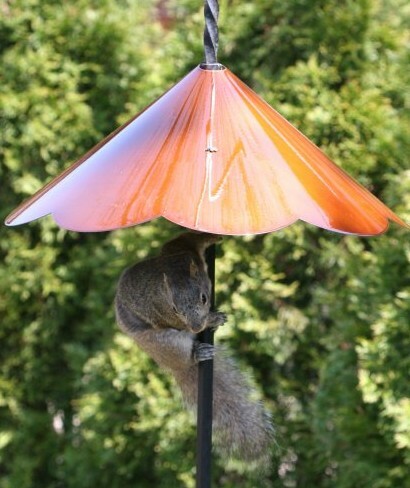 Whether your bird feeder hangs or happens to be post- or pole-mounted, there’s a quality squirrel baffle out there that will really do the trick… we promise. It is the proper placement of said baffle that allows for full functionality and 100% performance. 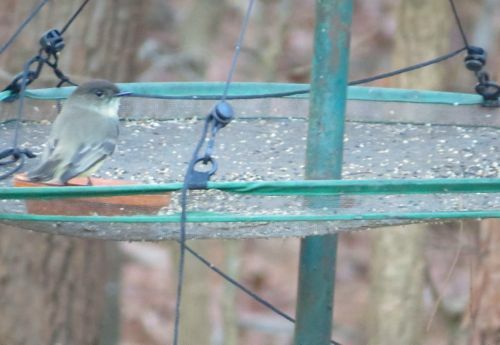 In the picture at left, the feeder has a dome, and although shaped like a hanging baffle, it’s fairly obvious that it is not. A weather guard and squirrel baffle are two different things. This furry one may have also jumped sideways from something to gain access as well. When we hear folks say they’ve quit feeding birds because of squirrels, it’s so sad because it’s fairly easy to keep the critters at bay. For almost 30 years, we’ve been feeding birds (and squirrels) without the squirrel head ache. Every single feeder in our yard has a baffle, even some nest boxes too! Baffles are ideal for protecting nestlings from predators. The most important factor to consider is feeder placement. Be certain there are no horizontal launching points from where the critters can jump. These would include any structure, tree or object… at all! Being extreme acrobats, one should never leave room for doubt when placing a new feeder. A small, one-time investment in a good baffle will result in many years of pleasurable experiences with wild bird feeding! Happy Thanksgiving and First Freeze for Heated Bird Baths! As stunning fall color is winding down, the season’s first freeze hit the southeast two days ago. Totally unprepared, it was most definitely time to dig out bath heaters and extension cords in order to prevent any birdbaths from freezing and cracking. 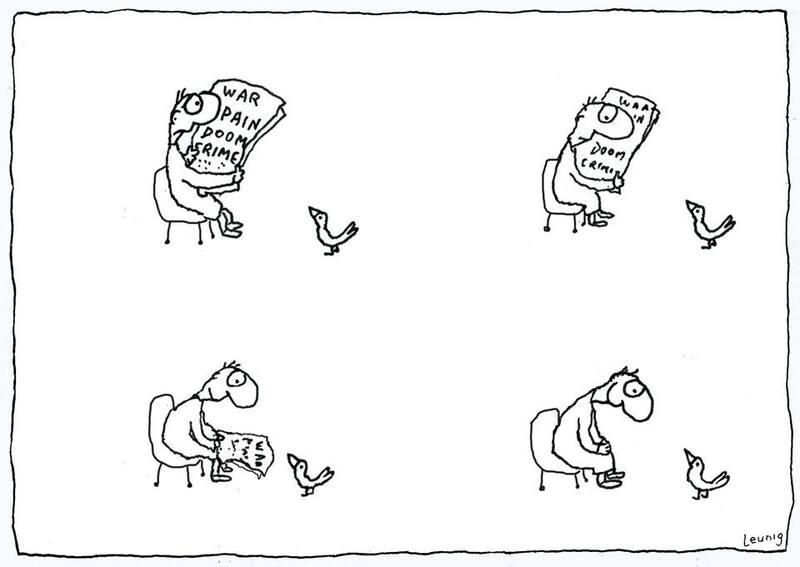 When you’re into birds… this is important stuff. The changing seasons require a bit of work to keep birds f at & happy, but so very worth the effort! Pedestal and ground baths simply get a heater placed inside to keep an open water source through winter. If you’re a bird… this is really important stuff when everything freezes! The heaters are compact, easy to use and safe for almost all types of baths. Come spring, simply unplug and store for next year. 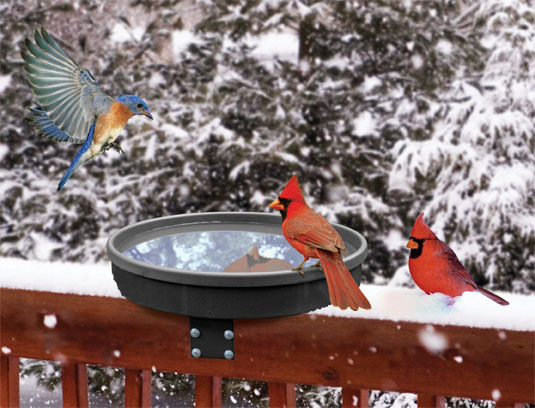 Deck-mounted heated bird baths are even easier since the heating element is concealed within the base. Everything stays put regardless of season, just plug it in and task complete! 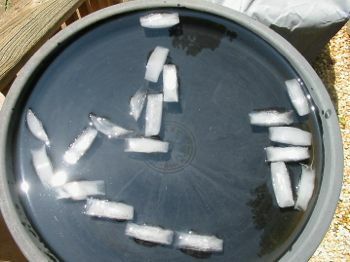 We use one of these at home too, and in summer (they don’t call it Hotlanta for nothing) we toss in ice cubes to cool the water and create a refreshing oasis for our feathered friends. We’re thankful for the birds and their uncanny ability to soothe the soul. Watching them through the kitchen window -even if just for a few minutes- can remove some of the chaos of daily life and any clutter inside your head… like planning and preparing dinner for 18 guests on Thanksgiving Day! The short & simple connection to nature can be a breath of fresh air, it calms, centers and quiets the mind. We want to get more folks “into birds” as well. It’s an addictive hobby which not only brings much pleasure and simple joy, but helps birds thrive through harsh winter weather when natural food sources are scarce. Many species stick around all year and are considered resident birds; chickadees, nuthatches, titmice, finches, bluebirds and cardinals to name just a few. Offering food, shelter and a fresh water source makes them thankful, and they’ll grace your landscape with song, color and life through the winter season to prove it! 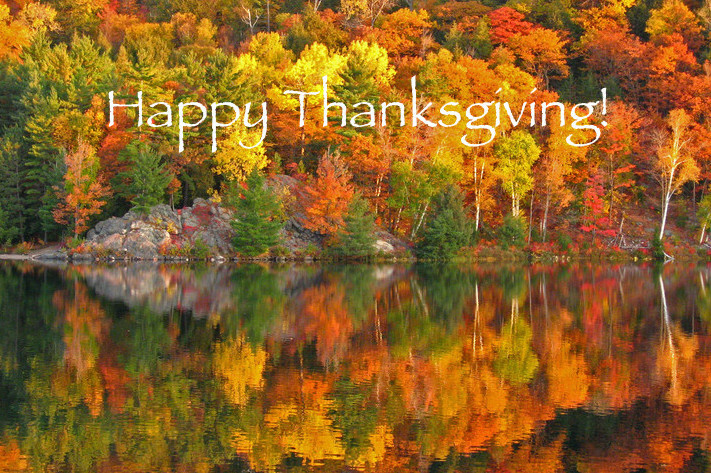 Happy Thanksgiving and safe travels to you and yours! So maybe you’re thinking about feeding the birds? But when surveying the yard for good spots to hang a feeder… there really aren’t any. A branch would work if you have suitable trees – but beware of crafty squirrels! If the yard is mostly open, a bird feeder bracket set like this is ideal for an instant oasis to entice feathered friends. It provides a solid & sturdy spot with room to grow. The water dish and tray are included, the latter offering a spot for just about anything you’d like to offer. Peanuts, suet & nuggets, mealworms (if you’re so inclined), even fruit in spring and summer for migratory birds. Any assortment of feeders could hang here, and they’d be most welcome by resident fliers in winter. 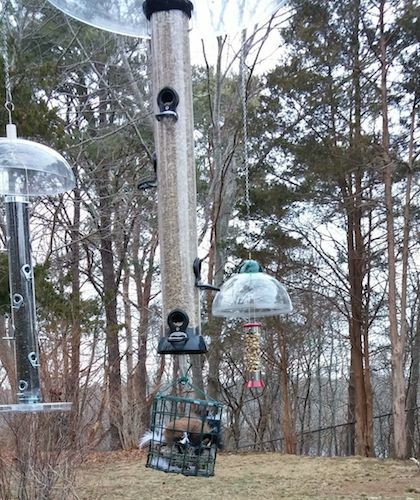 These include seed, suet, & peanut feeders and thistle/nyjer feeders for finches. Adding a baffle to the main pole will keep squirrels at bay too… believe it or not! Smaller scale? A simple deck-mount bracket might be the perfect answer. Especially if there’s a good view from the kitchen or breakfast area. The clamp-on hardware won’t harm deck rails, and a nice plant saucer works great for the dish. This can even be converted to a bath in summer, shallow pans are the perfect depth for birds to bathe and wade comfortably. Another complete bird feeding station includes the baffle. As long as squirrels can’t jump sideways from something to gain access- they’ll never make it past this baffle! We use this one at home and can absolutely confirm squirrel failure! With all the rain in Southeast lately, the ground has become overly saturated. The auger or ground screw on this set keeps feeder stations from looking like the Leaning Tower of Pisa! We have some of those too 🙁 The topper also comes with 4 brackets for room to grow. It’s a sturdy set that lasts for life.